Thorens TD 203 review | What Hi-Fi? When it comes to heritage, few hi-fi manufacturers can match Thorens. The brand was founded in 1883 to make music boxes, began making phonographs in 1903 and launched the legendary TD124 turntable in the late 1950s. That makes it all the more surprising that the company, in the UK at least, isn’t a dominant force in the ongoing vinyl resurgence. 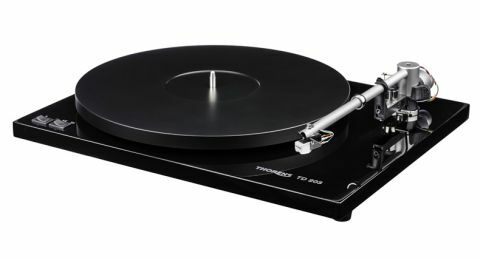 Thorens is hoping to change that with the new TD 203. Our first impressions are good. This is a nicely built deck and comes complete with arm and cartridge. There’s not much in the way of suspension, so it would make sense to position the deck well away from your speakers on a level, low resonance support. The deck is nicely made and finished. Unlike most rivals it comes as standard with an electronic speed change to skip from 33 1/3rpm to 45 rpm. The supplied TP-82 arm comes pre-fitted with a Thorens TAS 257 moving magnet cartridge, so you don’t need to worry about alignment. The cartridge is essentially a version of Audio Technica’s AT 3600. All you have to do is set the tracking force and fit the bias weight. Unusually, there are two counterweights on the back of the arm – the smaller one is there to allow fine-tuning of the arm’s azimuth ensuring the stylus tip sits vertically in the record groove when viewed from the front. The arm’s unipivot design means such an adjustment is sometimes necessary. Don’t be tempted to move the ring that sits in the middle of the aluminium arm tube. This is a vibration damper that only works properly in its original position. Assuming you’ve followed the detailed instruction manual and already fitted the drive belt and platter you’re ready to go. We plug the TD 203 into our reference system comprising a Cyrus Phono Signature phono stage, Gamut D3i/D200i amp and ATC SCM50 speakers as well as something more price compatible in the form of Rega’s Brio integrated amplifier and Dynaudio Emit 20 speakers. Those unfamiliar with unipivot designs will find using the TP-82 is a little odd – the arm pivots on a single point so it is free to wobble as it is queued. However, once it lands in the record groove any unwanted movement fades. We start off by playing Beethoven’s Ninth Symphony and the Thorens package sounds right at home. It delivers a neat and organised presentation that has a place for every instrument and sound. The stereo imaging is expansive, sounding impressively wide and large-scale. There’s also an admirable degree of precision in the way notes are rendered, having clean edges and plenty of harmonic richness. Tonally, things are even, though lacking a bit of authority. Class leading designs such as Rega’s Planar 3/Elys 2 are better at conveying substance, and certainly deliver dynamics with greater impact. We like the TD 203’s midrange though. Listen to Mary J Blige’s No More Drama and it has no trouble delivering her vocals with fluidity and insight. The deck captures the nuances well and communicates the emotion in her voice with skill. There’s a good degree of transparency and openness in this region. You can add pleasing agility and decent reach in the bass in the Plus column too. We like the Thorens’ cohesive approach to music replay but switching to its Rega rival reveals more in the way of rhythmic drive and excitement. The TD 203 makes it easy to appreciate the work that’s gone into the recording but falls a little short in outright entertainment. The Thorens TD203 is a nicely built and capable deck packed with good quality engineering. It’s unusual to find a unipivot arm on a product of this price and that decision certainly has an impact on the fluid dynamics, open midrange and good level of detail we hear. But this is a tough market, and as things stand this deck will struggle to make a notable impact on the class leading rivals. Manufacturer Thorens Services Ltd, Switzerland.